At the conclusion of the bloody and divisive Civil War, the United States continued driving westward. With the expansion into new territory came a multitude of challenges and dangers, including hazardous terrain and unfriendly native tribes. American military regiments were tasked with providing a protective force in unknown territory. Among the troops assigned these perilous duties were those of the 9th and 10th Cavalry and the 24th and 25th Infantry. These Army regiments – comprised solely of African-American service men – came to be known as the Buffalo Soldiers. They wore the moniker with pride, and it encompassed all-black units in the Army until the military was desegregated. The end of the Civil War brought the disbanding of regiments known collectively as the United States Colored Troops, which at its height constituted roughly 10 percent of the Union Army. As the nation entered peacetime, Congress restructured the military to meet the needs of a unified country. For the first time, African-Americans were able to enlist in a peacetime American Army per the Army Reorganization Act of 1866. Part of the act called for the formation of two all-black cavalry regiments (the 9th and 10th) and four infantry regiments (38th, 39th, 40th, and 41st), which would eventually be reduced and combined to form the 24th and 25th. Often, these four regiments worked and fought side-by-side, and together they helped craft and protect the settlement of the Southwest and Great Plains areas. While doing so, they carved a significant niche in black history. Soldiers of the 9th, 10th, 24th, and 25th regiments spent more than 20 years helping the nation expand into the west. These troops provided security for settler convoys, guarded post carriers, and built roads. They also regularly engaged in battle with hostile Native American tribes, including Apache, Kiowa, Cheyenne, and Comanche. During their encounters with these tribes, the regiments earned the now-legendary nickname of “Buffalo Soldiers.” History remains unclear about the origins of the label, but what’s apparent is that the group’s mystique and valor have survived the onward march of history. Some have credited the Comanche with coining the term, while others say it was the Cheyenne. There are accounts that claim the term was used to describe the fierce fighting tenacity of the troops, while different ones state the name stemmed from physical attributes. And others say it could have been a combination of the two. Regardless of how it was formed, the regiments accepted the nickname with pride. The 10th Cavalry Regiment even featured a buffalo on their coats of arms. The label became associated with every Army unit that could trace its roots back to these four regiments. The 9th and 10th Cavalry Regiments operated under mottos that were as succinct as they were impactful: “We Can, We Will” (9th) and “Ready and Forward” (10th). Though the Buffalo Soldiers endured hardships and discrimination – often at the hands of those they were tasked with protecting – they reached many notable accomplishments. They were involved in campaigns that led to the capture of prominent figures such as Geronimo and Pancho Villa. Following the end of the American-Indian Wars, they went on to fight in the Spanish-American War, the Philippine-American War, and both world wars. Through these engagements, the Buffalo Soldiers earned many Congressional Medals of Honor. They are even credited with being among the first rangers at Yosemite and Sequoia national parks. When the nation’s social climate began to change, President Harry Truman issued an executive order to end racial segregation in the military. By the mid-1950s, the remaining all-black units were officially disbanded. The last of the Buffalo Soldiers, Mark Matthews, died in 2005 at age 111. 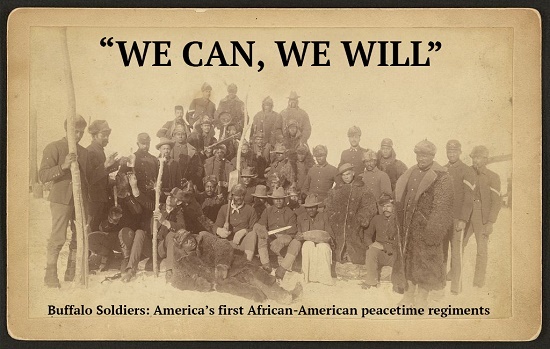 Although the living remnants have gone, the accomplishments of these first African-American peacetime units will stay alive in the history pages of the country they helped establish.